Four generations and over 100 years of experience are the basis of Arturo Fuente cigars superb reputation. With a lovely array of renowned series such as the Gran Reserva, Hemingway, Añejo, Magnum, Don Carlos, Chateau Fuente, and the crème de la crème, OpusX, it is evident the family takes their cigar production very seriously. 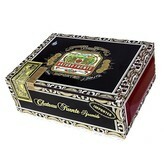 Never taking short cuts Fuente represents outstanding quality in the cigar world. Chateau Fuente Pyramid is perfectly rolled with hand selected tobacco from Chateau de la Fuente, the family’s plantation in the Dominican Republic. The Chateau’s private reserve provides some of the best tobaccos in the world. The fine aged filler and binder are encased by a golden Connecticut Shade wrapper. The mild to medium bodied smoke presents a nutty base with hints of spice, caramel and cedar. This fall, in commemoration of the one year anniversary of the passing of Carlos Fuente, the family partnered with Prometheus Humidors in releasing “Tribute to The Man” humidors. Only 100 limited editions are available, so I probably don’t have a chance of acquiring one, but I will smoke a Chateau Fuente in his honor.